Long Realty is pleased to welcome Sandy Canizales to the Foothills Office at 4051 E. Sunrise Drive, Suite 101, in Tucson, Arizona. “I became a real estate agent because I wanted to help people with one of the biggest purchases of their lives: buying a home. Long Realty is the best real estate company in Tucson to help people accomplish this. They offer proven expertise and all the services anybody may require in a real estate transaction,” said Sandy Canizales, Long Realty Agent. “My goal is to help my clients with a smooth transaction and a fulfilling real estate experience”. “Sandy’s speaks fluent English and Spanish, and her experience growing up with a multicultural background has positively influenced her customer relationships. She always respects and cares for the needs and concerns of her clients. She doesn’t just ease real estate transactions for them, she helps them find their home,” said Laura Mance, Long Realty Branch Manager of the Foothills Office. Sandy grew up in Mexico until the age of 18, when she moved to the United States. She attended Universidad Nacional de Bellas Artes in Mexico, Pima Community College, and Haverhill Institute of Staging and Design. She received her Real Estate License in November 2003 and has certifications in Short Sales & Foreclosures and Staging & Design. She also specializes in new homes and residential sales. Sandy has been married for 18 years and is the mother of two teenagers and a poodle. Growing up, she loved animals and the ranches and fields in Mexico. She has a passion for art and painting, and she loves to cook, bake and eat delicious food. For more information about Long Realty, visit www.LongRealty.com. Contact Sandy Canizales at sandycanizales@hotmail.com or visit her website at www.sandyc.longrealty.com. 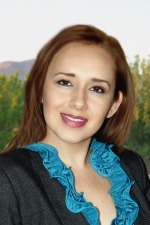 Share the post "Long Realty Welcomes Sandy Canizales to Foothills Office"